We were lucky that we didn’t have to wait for a table at all upon arrival. Lucky us! So no crazy long waits and fighting over number tags thank goodness. But do not take our word for it as we have seen photos of queues developing outside the shop before opening hours. Just a few luggage trolleys at the doorstep telling us that we are not the only non-locals around. Well, despite its relatively low profile, it is a michelin-starred establishment afterall. Surely it would bring about some level of curiosity amongst diners both at home and abroad. Despite the lack of queue in front of the store, the interior was packed with folks looking for a dimsum brunch. No shouting of orders, no loud chatting of elderly folks in colloquial Cantonese with their breakfast tea pals, the noise level was indeed much more subdued compared to a full-fledged old-school dimsum restaurant like Lim Heung Lau but nonetheless, the “mood for dimsum”is definitely in the air. Wasted no time to choose and pick the items we want to sample, as soon as we were ushered into our seats. Our order was a mixture of pretty standard dimsum fanfare just to “test the water”. If they are truly worth the michelin star, they’d better get the basics right. 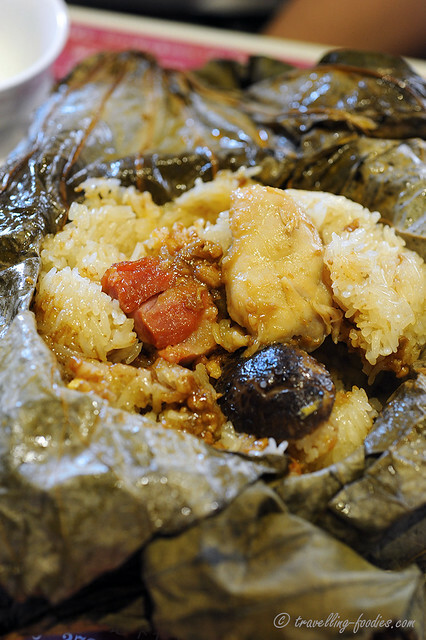 丰料糯米鸡 Lotus Leaf Wrapped Chicken and Glutinous Rice. Do not be deceived by its look. The portion was actually quite big, enough for two . 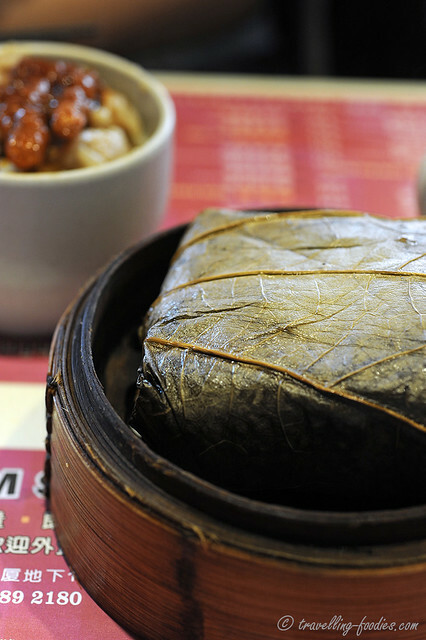 The glutinous rice was steamed to perfect consistency Very soft but still retaining a mild grainy texture, unlike some other joints which tend to tip the moisture level by soaking the rice or subsequently steaming it for too long causing the whole piece to become a soggy mushy mess. Not the one here at One Dimsum thankfully. The chunks of well marinated chicken, char siew and mushroom were also reasonably generous as the name of the dish implies. The marinade from the chicken seeped into the rice grains which happily lapped up all the wonderfully goodness. But my favorite lup cheong is missing. The oils that would have oozed out of the slices of chinese sausage would have done wonders to the rice. A slight disappointment but then again, I think I am just nitpicking. Very good on the whole. 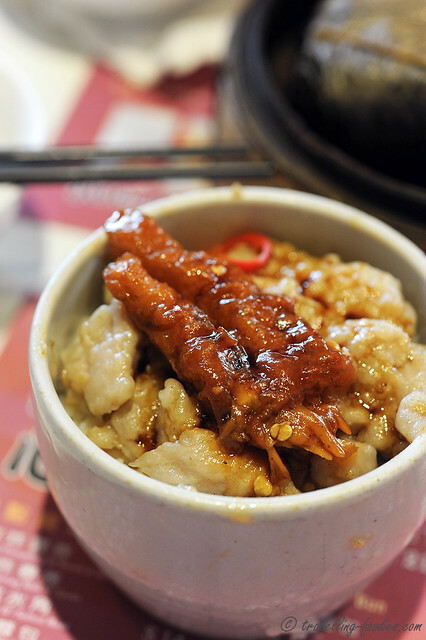 风爪排骨盅饭 Braised Chicken Feet and Spare Ribs Over Steamed Rice. Another staple dish we ordered. Braised Chicken Feet in Spicy Fermented Black Bean Sauce is one of my absolute favorites and “must-order” whenever I am in a dimsum deli. We would have ordered the spare ribs and chicken feet separately as two dishes but given how small the table and how cramped the seating was (not unlike Tin Ho Wan), we reckoned that separate dishes would have problems fitting the small little square between us… Silly me actually since the bamboo steaming baskets were made precisely to be stacked! The lone chicken claw was very very good! Regretted not ordering one whole portion! The spare ribs were also pretty decent, silky soft textures from the use of corn flour in the marinade but not doing it too overtly which would give a somewhat starchy sensation in the mouth. Well balanced. The sauces from the spare ribs and chicken feet permeate down to the rice grains seasoning them amply. Normally, light soya sauce would be drizzled over the rice but in this case, it was totally redundant. Good. 韭黄炸春卷 Deep Fried Spring Rolls with Chives. 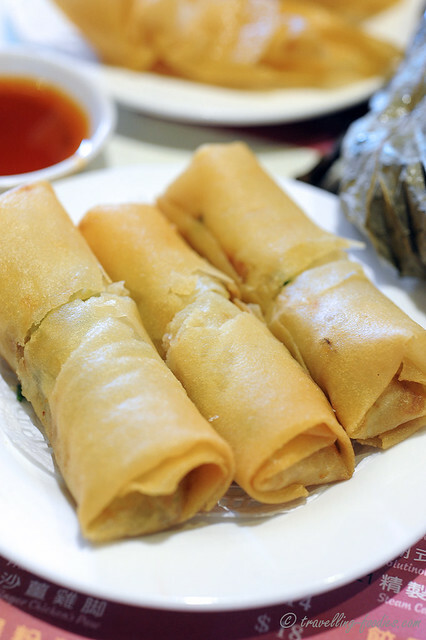 Spring rolls are J’s favorites and something which we would usually order. And the dimsum folks in Hong Kong are really innovative on the filling. Unlike the run-in-the-mill jicama and carrots filling, this version at One DimSum is done with yellow chives. Very very fragrant in the interior and crisp on the exterior. 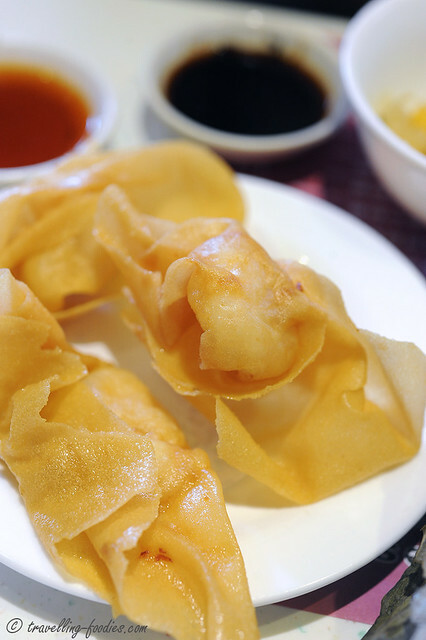 酸甜炸云吞 Deep Fried Wanton Dumplings in Sweet and Sour Sauce. Always been intrigued by these deep fried wanton dumplings served in dimsum delis. Oversized doughskin wraps over a single prawn. The little fella in the middle was well-seasoned and succulent alright but overall, bits of the crispy skin had already broken off when served, dampening the aesthetics of the pieces . Yes, we have seen really pretty ones elsewhere which open up like little chinese fans with frilly edges! Also, its a tad too oily for our liking. The “sweet and sour” sauce tasted much like bottled thai chilli with a lot more sugar added… not recommended. 蜜汁叉烧卷 Char Siew Rice Rolls. Yet another dimsum deli favorite. But unfortunately it wasn’t as well executed as what we had tried elsewhere. The rice rolls were tacky, sticking onto each other upon being stacked as shown, lacking in much of the silky textures I was hoping for and would have preferred. The filling was also disappointing somewhat. Without the “saucy” texture despite its description in the name. It seems like char siew dishes are not exactly their forte. Avoid. 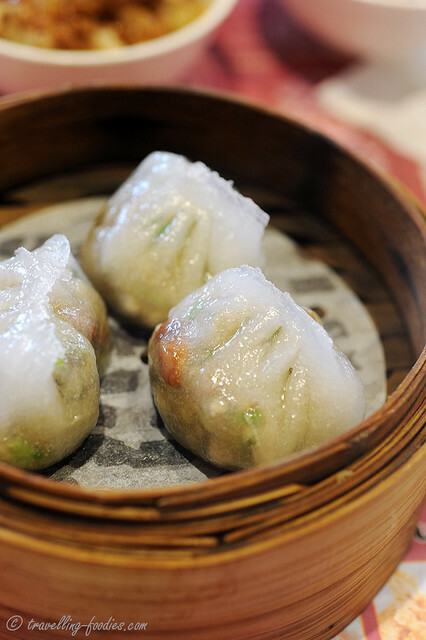 潮州蒸粉粿 Steamed Dumplings Teochew Style. I love this dish and tend to be bias for it as I love eating soon kueh, which are essentially variations of the same theme with these smaller fellas. I would opt for these anytime over the standard har gao shrimp dumplings. The skin was made really soft, thin and translucent, with the ingredients vaguely peeking through, suggesting what might have been encapsulated within. The standard jicama, roasted peanuts, chinese coriander actually, but well made. Yes I couldn’t stand it anymore! 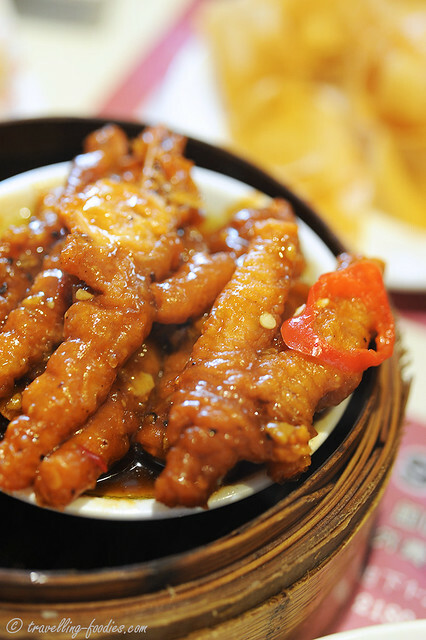 Need to have more chicken feet! Ordered one portion of 豆豉蒸风爪 to finish all by myself! The braised chicken feet was very very well done. Yes I am not exaggerating. Well marinated without being too spicy or savory, the little digits encasing wobbly collagen were perfect. I’d tried lesser desirable ones in other rather famous dimsum joints in Hong Kong whereby the sauce is either too overpowering or the chicken feet had been steamed for a tad too long, with the skin disintegrating upon lifting up with the chopsticks. 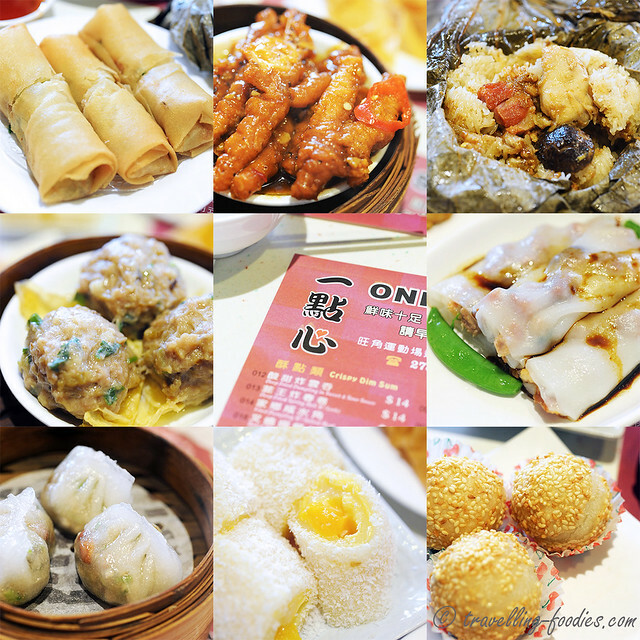 The version at One Dimsum is good! Enough said. Two sweet dessert numbers after a wholesome round of savory dishes. 雷莎炸煎堆 Deep fried Sesame Balls. One of J’s favorites to have. The external coating was very crisp, immediately served out of the oil wok it seems. Caught totally offguard as we we each sink our teeth into one, the black sesame filling literally spewed and scalded our tongues! So eat with caution! But overall very good with the 爆浆 followed by 流砂 effect from the filling. The filling was also not too sweet, which is good! No photos of the interior sorry as we were frantically gulping down chinese tea (warm!) to save our tongues. But that is our fault really. 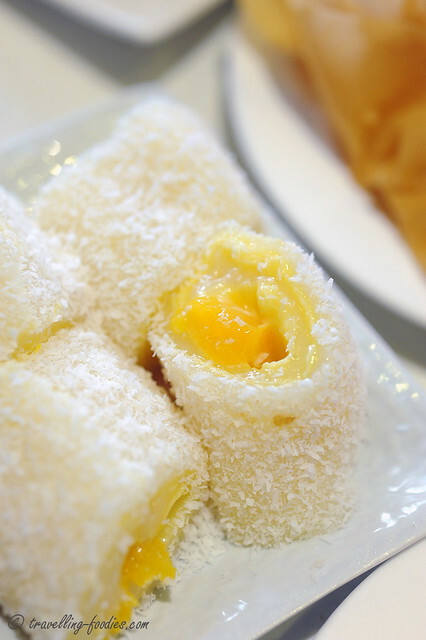 椰香芒果卷 Mango and Coconut Rolls, a seasonal item not on the regular menu. Rolls of mango pieces in mango puree sauce over dessicated coconut. Very refreshing as a palate cleanser to end off the meal I thought that it would have been more interesting if they had “upgraded” it to a 杨枝甘露 Yueng Jee Gam Luk version if they had been able to incorporate pomelo gulp and sago pearls as well. That would have made it very interesting! While the quality of food is generally decent, it is not without hiccups. We also noted the significant price hikes in 2012 compared to 2011 just after they were conferred their michelin star. For example, the deep fried wanton dumplings and spring rolls were previously HKD 10 compared to HKD 14 when we’d visited. 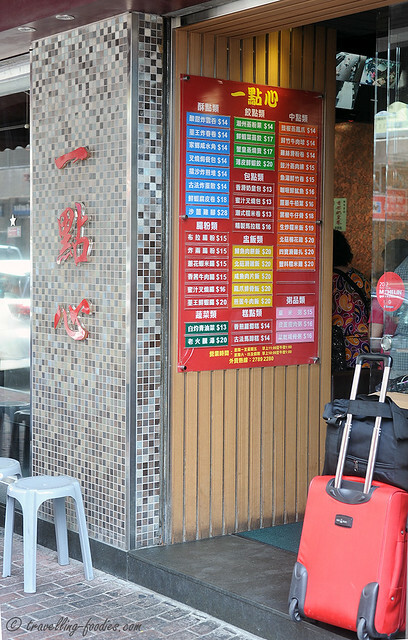 Perhaps One Dimsum would like to concentrate on making their food better and not just blatantly raise their prices. We felt that improving the consistency of the overall standards of the dishes is in dire need. While some were very good and outshone the rest, others were lesser enjoyable. 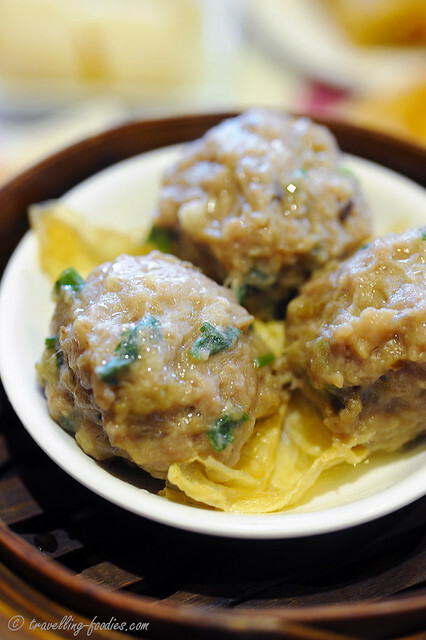 Another factor which is severely lacking for One Dimsum, is a dish which could help diners remember them by more effectively. 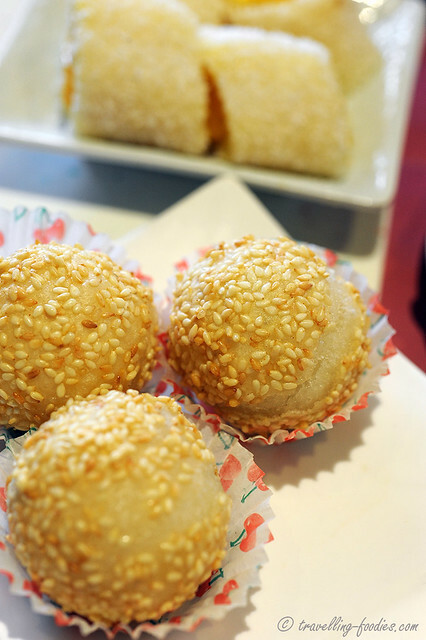 For Tin Ho Wan, it has got to be their Char Siu Bo Lo Buns. I concur with the masses that Tin Ho Wan’s version is probably the best ever. Absolutely wicked! For One Dimsum they do not have a signature piece which could help us leave a “oh yah! I had that too!!!! It was sooo freakin’ gooood!! !” *gasp* kind of response which would trigger a certain level of excitement just from reminiscing the exceptionally memorable experience. Perhaps that is the missing piece of the puzzle for them. This entry was posted on April 18, 2013 by Alan (travellingfoodies). 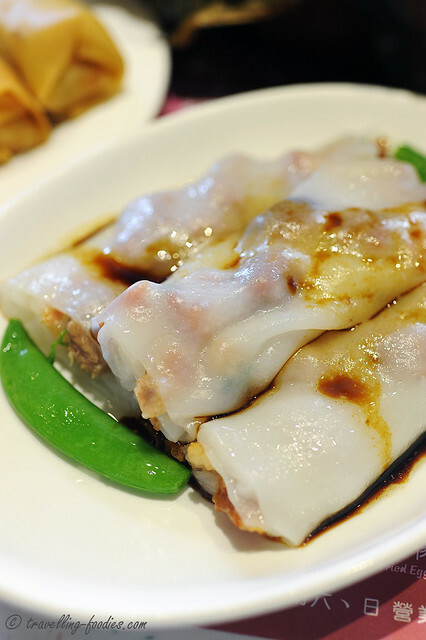 It was filed under Food, Travel and was tagged with chee cheong fun, 炸春卷, 炸云吞, 点心, 煎堆, deep fried spring rolls, dianxin, Dimsum, 荷叶饭, 风爪, 香椰芒果卷, 點心, fried wanton, Hong Kong, lotus leaf rice, michellin star, mongkok, prince edward, rice flour rolls, sesame balls, steamed beef balls, 免治牛肉丸, 一點心, 潮州粉粿. Now that is some tasty looking food! Hi Alan! The Dim Sum looks really good. Although you mentioned some hits and misses, I am truly okay to go One Dim Sum for the simple reason that there is no queue and noise! Any idea what is d operating hours ? Izack, did you ever find an answer to this question? I’m landing in HK at 6am and want to go there right away but can’t figure out what time they open. 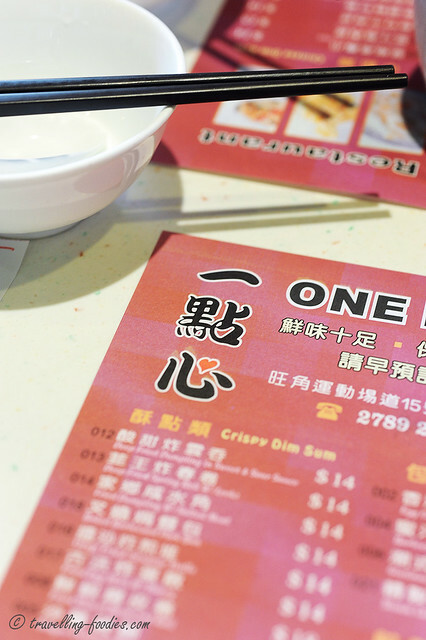 Each time we head to HK – Tin Ho Wan is at the top of the list. We have been lucky and only have had to wait in the queue for a maximum of 30 minutes. It is well worth the wait. Great post.